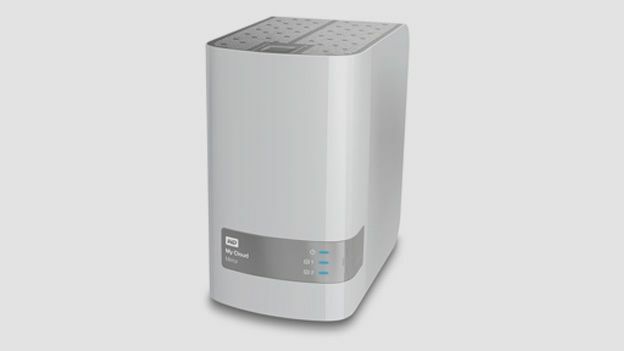 The WD My Cloud Mirror is a dual-bay update to the 'My Cloud' series of consumer-focused NAS drives. Consumer focus in this case meaning that much of the setup pain is removed by a series of wizards and a variety of apps. Critically, the WD My Cloud ranges come with HD's already installed, unlike some competitors. This means you can quite literally plug in and forget, rather than having to build your own backup array – a task that not everyone fancies of a bank holiday. First up the design of the WD My Cloud Mirror is standard enough – some small touches such as the nicely designed drive eject buttons – for those police raid moments - and the simple blue LEDs to show you what the drives are up to rescue it from being a black 'rack mount box'. It's much more Apple-esque, although you're unlikely to keep it on the mantlepiece. As this is a dual-bay RAID (redundant array of independent disks)drive it's slightly wider than its slimmer My Cloud cousin, so you'll need a touch more space down the back of the sofa. MyCloud Mirror is available in three capacities: 4TB, 6TB and 8TB, and is compatible with Windows or Mac. The capacity is divided in half by default, with half of the capacity being used to store your data and the other half being used for a duplicate copy. In the event of one drive failing, your data is protected because it's duplicated on the other drive. Obviously, this doesn't help if the unit itself is stolen, so it's a good idea to keep it out of sight. In addition, you can attach a compatible USB 3.0 hard drive to one of the two USB expansion ports to add more storage without having to faff with the HD's themselves, which is a blessing. Setup is the easiest possible, simply plug in the drive and connect to your router. Auto network discovery means finding your Wi-Fi is a synch too. Connecting a MacBook Air in this case was a synch, but the auto-install of homescreen shortcuts reveals the achilles heel of the My Cloud – there's a lot of them. My Cloud Backup, My Cloud Photos and My Cloud admin all deliver slightly different UI's, while you'll be prompted to create several different passwords for access to content within the drive, and access to the apps. It's not always clear which password you're being prompted for, and this is the one setup area that could be easier. In operation the WD My Cloud Mirror is almost silent, just the occasional whirr of discs and a blue LED to give away the fact it's working at all. Once setup with Apple Time Machine it's a seamless backup system, requiring absolutely no user action at all. Obviously this is mainly due to Time Machine, but the WD kicks up no additional steps. With 2TB of storage in our test unit there's plenty of space for storing video, photos and music, which once you've worked out which app to use, is a drag and drop affair. All data is accessible on the move via the apps, creating your own personal cloud. The MyCloud Mirror is a superb standalone backup solution, and with RAID as default it's as safe as you'll get without buying rackspace in a hosting company. It's PC and Mac compatible, and the mobile apps for iOS and Android are a snip to use. It's all about usability, and bar the multitude of apps, it delivers in spades. At around £259 it's not the cheapest option, but neither is it the most expensive, and it's certainly among the least complex to get up and running. The advanced options mean you get down and dirty with your setup if you want to, but the market this is aimed at aren't interested.